Price DROP $300 NT NOW 754-264-2631 HUGE FRONT YARD WITH RIVER ACCESS. *MS. Packman, Sauna, Foose ball, Poker table, Air hockey, Horsehoes, too much to Tell! Beautiful cabin on the river. This cabin is open and spacious with 4600 sq. feet under air there is more than enough room for everyone to have fun. The 28' vaulted cieling in the great room is as majestic as is the stack stack stone, wood burning fireplace to match. 60' flat panel tv. The chefs kitchen with sitting bar flows into the great room and extra sitting area to keep all of your freinds and family close by complete with 1/2 bath. A five burner ceramic cooktop and double oven complement the kitchen that is stocked with all you will need to prepare a fabulous meal. For the BBQ master in the group there is a Weber Genesis gas grill with side burner and also a charcoal grill steps to the kitchen. Main level master suite also has a stack stone jacuzzi tub,and a king bed. Upstairs is a bdrm. with a queen and a twin bunk and a king bed in the sleeping loft and a full bath. Downstairs there are 2 bedrooms, one with a queen bunk, the other a king with a jack and jill full bath. How many ways to have fun? : Inside the houses game room you'll find a pac-man arcade game, 8' slate pool table, air hockey, fooseball, card/game table, stere,fridg. and a suana. outside is a 7 person hot tub, horseshoes, a fire pit and enough rolling yard to play football. Down by the river.there is a picnic table and a fire pit. with its gentle flowing water you can take a stroll, grab a tube and float it, Fish for trout, smallmouth, redeye or other fish right out your back door or just sit back and enjoy. With 70' of decks across the back of the house lined with chairs you may just want to relax watching the others play(keep an ear open for Dollywoods train horn}. No matter what you plan on doing this fabulous cabin can suite you needs and then some. We built this 5,500 SF cabin as a cabin home. We lived in it for a few years and decided we did not need such a big cabin. We are form South Florida worked for BSO for 25 years. We love renting out our home to people who love to get away and have fun. 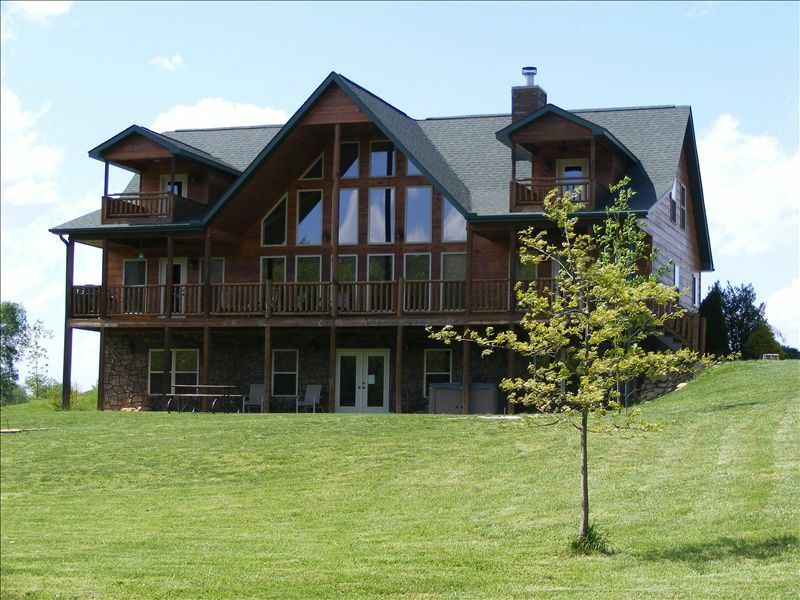 This huge cabin has a huge front yard for kids to play and hang out. It has a small country road that you can walk across to get to your own private river front were you can fish, play and float you cares away. Plenty of room for everyone . Private river front across small two lane country road. Kids can't get to it with out you. (Safe) Alarms on all windows and doors so you know when one should open or close. open floor plane so you can cook and still be a part of the party. Near Dollywood, Pigeon Forge, Gatlinburg and just really everything. a lot, bring trailers and RV motor cycles welcome. Our whole family, ages range from 11 to 76, all thoroughly enjoyed our stay here! So much to do, we didn’t even want to leave to go into town! Will definitely stay again! We are so glad you all had a great time! Sometimes you just catch yourself drinking some coffee on the porch and rocking the day away. Property is large and we had plenty of room for all of us (12 people). Some of the items advertised weren't available because they weren't clean. Outdoor grills were completely unusable as well as fire pit. I think the properly may have been empty for a while because there was an abundance of spider webs and dust everywhere. Kitchen is huge and open. Stove is tricky but once we learned its tricks we were all set. Overall good property, just wish it was cleaner. We bought cleaning supplies to clean up as much as we could. I give it 3 out of 5 stars. Thank you very much for your constructive comments. We hope you enjoyed your stay despite your concerns. The grills have been replaced, as we do once a year. We apologize for the difficulties you encountered with our local spiders. Some years the spiders are more abundant- as was this year-you clean the webs and they are right behind you building their homes. We had spoken with our cleaning service after your comments and addressed your issues. Thank you again for spending your family time with us. Hope to see you again soon! The property was nice and well kept. We have been staying in the area for 24 seasons and this stay ranks near the top. Thank you so very much for the nice review .We are just a small mom and pop business ,We try our best to make sure our guest have everything they need .We are so glad you enjoyed your time here and please come back and see us Again. Thank you for taking your time out to give us a nice Review . What an amazing place and the most friendley care takers ever. We went to Sevierville for my wife's birthday and were lucky enough to bring family and friends along with us. After traveling 12 hours we were lucky enough to be able to check in early around 10am. My wife and daughter went right into the huge kitchen and started getting lunch ready after we stoped at the new Walmart just 8 minutes down the road. Very convenient to most everything we wanted and needed to do. We loved the set up of the cabin and it was very clean an much to our liking. The cabin was very well kept and any questions we had the owner was able to help us out with right away. This well be out get away once a year as long as we are lucky enough to stay here. The small kids and older teens had plenty to do. There is a river across the road that we had a lot of fun in. I would rate this cabin a 5 out of 5 and its on our best cabin list for the future stays. Thank you for letting us enjoy your cabin. Our extended family of 14 stayed here for a long weekend. Everyone enjoyed themselves. The grandchildren especially enjoyed the game and media rooms. Very peaceful. Plenty of room for everyone. The city swimming pool was a short drive away and very nice. Close to restaurants, if you want a night off from cooking. The place looked just like the pictures. Clean and the kitchen had enough dinnerware for the whole family. Would recommend this place for a family vacation. A peaceful retreat yet so close to shopping and attractions. We went with 5 branches of our family. Each sub family group had their own space to escape to when needed and there was plenty of room when we were all together. The property is full of things to do and many were untouched as our time was limited. It was a great place to take the WHOLE family and we can't wait to return. Everyone had fun! Thank you so much for the wonderful review, most people tell us but they never take the time to write it in our VRBO or Facebook, having no idea how this helps our business thrive and helps others make their choices. We are so glad that you all had the time to get away and relax a little at our favorite cabin. It was totally our pleasure to have you. So if you need to get away again just drop us a line and we will make a spot for you. This beautiful brand new cabin will have you filled with peaceful thoughts as you take in the majestic mountains and the sounds of the river that runs across from it. Sit with your family in the evenings on the relaxing deck or around a cozy fire in the fire pit out in the huge front yard that has plenty of room for the kids to run and play. You will be enraptured with the floor to ceiling stacked stone wood burning fireplace in the living room. With a wide open floor plan the whole group can mingle during the evenings since the kitchen is right off the living and dining room. It makes it much easier for your group to interact since you are not separated while preparing for the evening meal or just grabbing a light snack. With stainless steal appliances and stone counter tops anyone would be in heaven in this modern day chef's kitchen. 200 - 600 the pet fee is for small dogs and per dog. all dogs have to be crated and NOT IN BED or on furniture or there will be an additional fee.